Hide ‘n seek! An all-time favorite with all kids… but my nephew would always give himself away by peeking out from wherever he was hiding so it was always easy to catch him! LOL. LOL! They are very good at imitating at this stage. Try to hide behind the curtains..he will imitate you instantly. Belle still loves to hide behind the curtains and when we ask “where is belle?”..she would peek from the curtain and give us a mischievious grin. 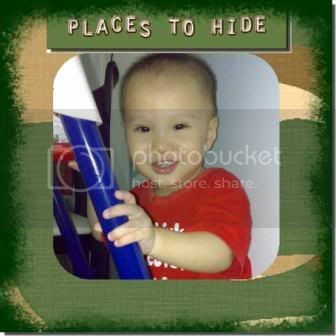 Joyce says: Ethan already loves to play hide n seek in the curtains even without our cue!